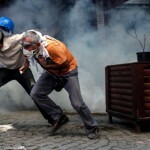 What's Behind Turkey's Crackdown on the May 1 Protests? Turkish riot police use water cannons and tear gas to disperse protesters during a May Day demonstration on May 1, (Photo Credit: Burak Kara/Getty Images). When authorities have allowed Mayday rallies…they have passed peacefully and without injuries or damage to property. 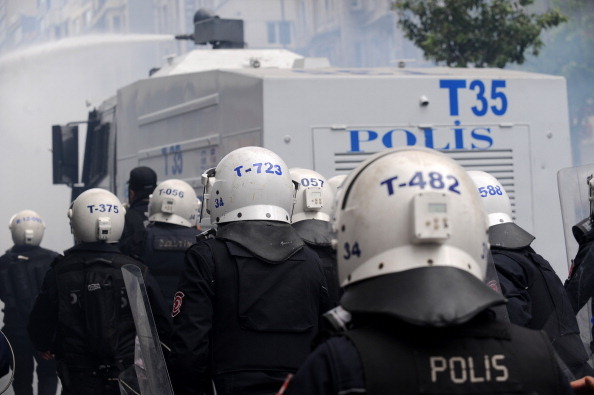 On occasions where the authorities have refused permission for Taksim Mayday rallies to take place, they have resulted in the use of abusive force by police against demonstrators, injuries and major disruption across the city. After several years in which large-scale rallies were held in Taksim without incident, Turkish authorities decided last year to close off access to the square. Given all this, today's crackdown on freedom of expression and assembly was utterly predictable, as was the violence that resulted. Indeed the “disturbing pattern” that I saw last year continued and intensified. Only a month later, Turkey would be rocked by what has been termed the “Gezi Protests” More suppression of the rights of freedom of expression and assembly, more police violence, more injuries, more impunity. The government’s response to public and international outcry has been to seek scapegoats, intensify its pressure on dissenting voices, and maximize its control over the levers of state. Only last month, a new intelligence law was passed which greatly increased the intelligence service’s capacity to act with impunity and to spy on its citizens, while dramatically extending the government’s ability to punish journalists who publish leaked information. As Human Rights Watch’s Kenneth Roth stated, were this law in effect in the United States, the editors of the Washington Post would have had to celebrate their recent Pulitzer Prize in prison. Given all this, today’s crackdown on freedom of expression and assembly was utterly predictable, as was the violence that resulted. Certainly, the Turkish government seemed ready for a fight. “Give up your hope of Taksim,” Turkish Prime Minister Tayyip Erdogan warned. Important transportation hubs were closed and, according to press reports, nearly 40,000 police were mobilized. Not only Taksim Square itself, but streets throughout the city were barricaded and guarded by phalanxes of heavily armed police. Large sections of the city were, effectively shut down. Why? Variously, according to government officials, to “ensure the safety of the people” and because it would disrupt traffic in Taksim Square. Instead, the government initiated a policy which has reportedly resulted in scores injured, many seriously, and locked down the city. Normally vibrant Taksim today was occupied only by police and pigeons. 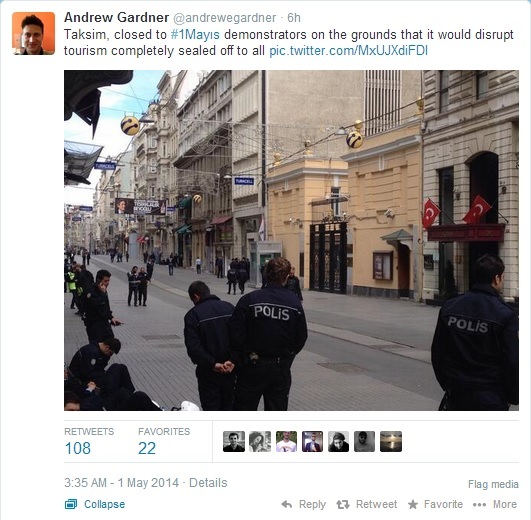 “A peaceful march this morning was cut off by a human wall of riot police blocking the main access road from ªiºli into Taksim Square, the epicentre of last year’s Gezi Park protests,” said Andrew Gardner, Amnesty International’s Turkey expert, who witnessed the events first-hand. As I write these lines, the violence in Istanbul and elsewhere in Turkey continues, while major arteries within Istanbul are still closed. It seems that the pattern of police violence and the suppression of basic freedoms has been set. In a month will be the anniversary of the Gezi Protests. I fear we are in for a long, hot summer. This entry was posted in Censorship and Free Speech, Europe, Security and Human Rights and tagged censorship and free speech, Europe, right to organize, security and human rights, Turkey by Howard Eissenstat. Bookmark the permalink. It's a very strange situation which I would like to know more about. I'll post some interesting video for https://youtu.be/zvSzBCNyqbE to let others know more too.